Sharp continues to pound away at these huge TVs and very successfully we might add. There is certainly a market for value in a very large screen as we've watched as people flock to large TVs at electronics shows such as CES. 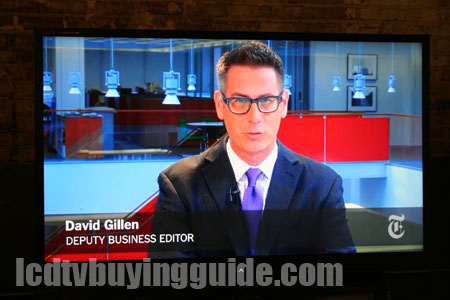 This 2012 model edge lit LED Television will be a great value play in Sharp's lineup. It has many upgrade features such as Aquos Advantage live, a 120Hz frame rate processing conversion, and other nice features. Dont count on the built in web browser. That's my Yoda-esque way of saying the TV lacks picture depth perception. LED-LCD screens often do have this problem, though it can be more pronounced on some than others. That's the case with the Sharp LC-60LE745U. I would say this is one of the flattest screens we've seen in a couple of years partly due to the matte-type screen finish and partly due to the panel itself. A good plasma TV for instance will look substantially better in this area when comparing side to side or just straight on depth perception. These large Sharp LED-LCDs have very bright whites so they eye-catching in the store. Plasma TVs by contrast look dim as the peak white do not compete. But take the TVs home and put them in a dark room with a colorful movie and you will see a much stronger picture performance on the good plasma screens or the better LED-LCDs that have overcome many of the negative picture symptoms of LCDs. But then if you need that super brightness and high whites for a brightly lit room, especially on football Saturdays and Sundays, then the Sharp LE745U will look very good. This TV is certainly a good choice for that type scenario. After watching a bit of the Blu-Ray of The Fifth Element we immediately noticed the depletion of natural background blur. We've seen this before in other brands and it's always distracting when done to excess. In the Sharp, it's done to excess in 2012. It's actually a de-judder mode in that it removes that jerky motion you see when watching movies during motion scenes – thus Sharp's naming it the Film Mode. The tradeoff is not a good one in our opinion. Turn it off for all film based content. Otherwise, you get a “soap opera” effect during films as background blur is eliminated. When you turn it off, you will likely notice some judder effects for a slight time until you get used to it. Ironically, you may want to leave the feature on for live action sports or other live fast motion programs as it delivers a smoothing quality, but turn the film mode off for film content. Dynamic Fixed – Automatically converts the picture into advanced Film Mode and does not allow adjustment of many of the individual settings within picture settings such as Black Level, Film, Active Contrast. Since you cannot adjust the Film Mode setting from this mode we recommend staying away from it. It sets the various setting depending upon what content is playing. The LE745U has a semi-matte type screen finish which is not our favorite. We prefer the clearer coated screens even though they have a bit more reflection. Matte finish screens do still have glare from in-room lighting– just less reflection. The higher end TVs in the market have clearer screen finishes with more expensive screen filters that help reduce glare even though the panel is clear. Drawbacks to a matte-type screen finish are those listed in this review – lack of picture depth, poorer side angle viewing and sometimes non-stellar black levels. Color rendition looks good, but just a touch on the unnatural and green side after calibration to D65K of the Movie mode – even completely adjusting the 10 point white balance setting. The green push is not there from the User mode after some light calibration there. If you want that cinematic look, go with our Movie mode settings, and if you want a more lively color rendition for sports so with the User mode recommendation. Colors do really pop from broadcast sources but still lack some depth. The active 3D on this massive television send full 1080p resolution to each eye so the LC-70LE745U doesn't sacrifice any detail in 3D and the image has plenty of depth. 3D works really well on a very large screen and it will definitely immerse you in the programing. Colors looked great, there was little to no crosstalk and I much prefer the 3D picture on this TV to the 2D picture due to the added depth perception and richer picture. However, there is a drawback. Sharp's 3D glasses are proprietary and generic active shutter glasses nor other manufacturers glasses will work with the Sharp TVs. The AN-3DG20-B glasses cost around $50 per pair, are big, clunky, ugly and will slip off your nose easily. Other than that, they do exhibit some flicker if there is a light source other than the TV in front of you. Those complaints out there, the 3D picture in a dark room scenario is great. We just need some better, cheaper glasses Sharp and you're on your way. Although this feature is included on the LE745U we do not recommend it. Some manufacturers have improved this feature (LG, Samsung) enough so that you can actually use it and benefit from it but Sharp is not one of them. The 3 dimensional effects are very slight, the picture much darker, and considerable judder and jerky motion elements. It's not a feature you will use much. Like many LED edge lit LCD televisions the contrast and color saturation starts to degrade once you get about 15 degrees off center on the LC-60LE745U and just outside the screen area and gets worse the more you go. I would say Sharp is one of the worst offenders in this area. The other problem is the severity by which they decrease in saturation – quite a lot. It's not even a picture worth watching from side angles. The LC-60LE745U has a black brushed aluminum metal bezel framing. It's classy and refined and I like the feel of the solid metal. It's thin and the matte finish leaves no annoying reflection from in-room light. The TV is thin at just slightly more than an inch in depth (except for a protrusion in the back where the speakers are located) and the sides of the frame are very thin at .7" inches. 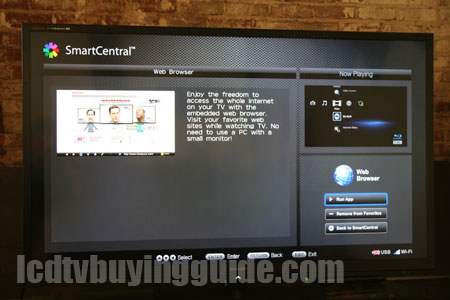 Sharp's built in Wifi comes in handy in the LC-60LE745U to connect to the Smart TV Internet options for 2012, but not necessarily the browser. CNBC App There is a list of stocks which can be edited and selected on-screen while watching the clips.Rating: 4.5 out of 5. Discovery – Short Clips from Discovery about 30 of them in all. 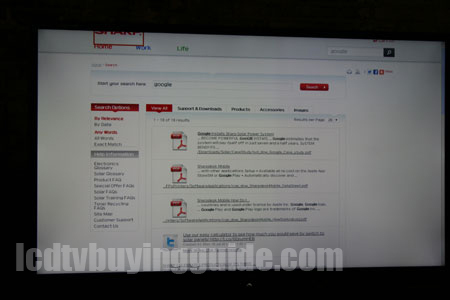 Sharp's Smart Central Browser- Hah! Useless! As you can guess by this reaction, we're not fans of the built in browser. It's a Sharp proprietary affair similar to Sony's and isnt worth a hoot. Just consider this TV as not really having a web browser and lower your expectations. And just in case you are wondering, no you cannot just access another search engine and get results that way. Searching for “Google” or “Bing” shows brings up Sharp results from their web sites (as in some document that contains the word Google) – PDF docs which will not even open once you click on them. 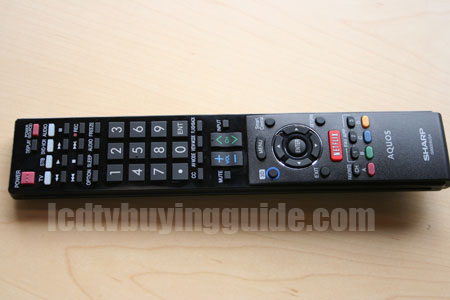 The long slender remote control has some very tiny buttons such as the Input button located just to the rigtht of the small channels control. It takes a little getting used to finding the small buttons. Even the 5-way controller arrow keys are too small which makes browsing and toggling between choices a little slower than normal. The menu broad categories runs across the top of the screen and then down the right hand side for breakdown choices leaving a large area for the content you are watching. The graphics and system is not attractive but work well and allow for a large picture viewing while making adjustments. Value is what the LC-60LE745U is all about. Its got a strong set of features with varying qualities among them, but most of all its the price per square inch equation that Sharp is really winning on. 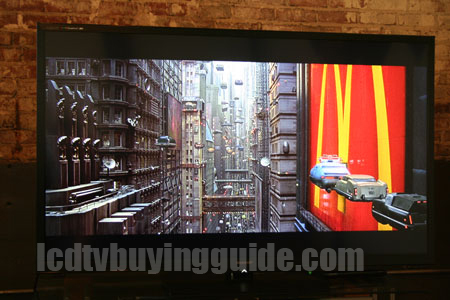 Only plasma TVs from Panasonic or Samsung compete as well or better. 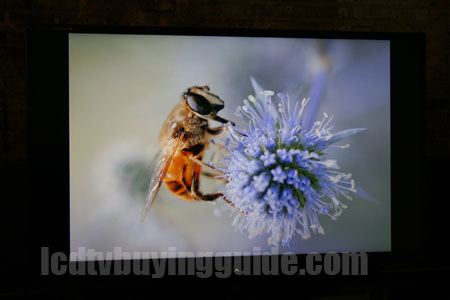 There are few other LED TVs in 60”, the Samsung UN60ES7100 is one. It will beat the LE745U handily in picture quality but is a chunk more expensive. Panasonic's TC-P60ST50 is a strong comp.